Update, March 19: You want to know how lucrative Twitch streaming can be? Think around half-a-million dollars a month. Fortnite may not yet be the biggest game in the world, but at this point it’s in the conversation. If any one moment solidified that fact, it was last week’s Twitch stream from Ninja, who – with a little help from Drake – set a massive new record for viewership on an individual channel with over 600,000 concurrent viewers. With those kind of numbers, you’d expect that Ninja’s doing quite well for himself. Curious? Get started with our Fortnite Battle Royale guide. Tyler “Ninja” Blevins was interviewed on business channel CNBC, where it was revealed the streamer is making over $500,000 per month. That’s thanks in large part to Twitch Prime subscriptions, which he receives 50% of the profits from, in addition to revenue from YouTube and other outlets. If you’re also looking for some non-gaming newscasters to express their incredulity at the idea of watching people play games, you can get plenty of that here. Ninja attributes his success to a combination of high-level gameplay and light-hearted entertainment, along with what he calls a “positive environment” in his streams. 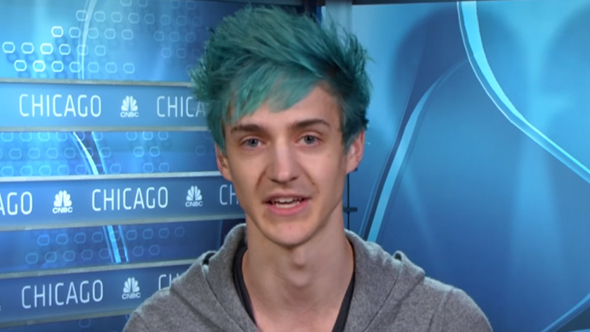 Before you start thinking about a crazy career jump, Ninja does say he stayed in school and kept his day job while building up a streaming presence, and recommends that others do the same. He’s also doing the responsible thing with his newfound wealth, through a combination of investment, savings, and charity donations. Original story, March 7: Epic Games aren’t the only ones jumping for joy in response to the overwhelming success of Fortnite Battle Royale. Twitch streamer Tyler Blevins, aka ‘Ninja’, is also riding Epic’s wave of popularity, drawing subscribers in unprecedented numbers. Back when Fortnite launched in July 2017, Ninja had a grand total of 5,490 subscribers, having built his channel mainly on H1Z1 and Halo, in which he is a former pro. Today, that number is over 128,000. Assuming they all use the lowest sub tier of $4.99 per month, and accounting for Twitch’s 50% cut, that means Ninja earns roughly $11,000 a day. And that’s a conservative estimate, as it does not include donations, advertising, his YouTube channel, or the fact that Twitch sometimes takes a lower percentage the more successful a streamer becomes. Astonishingly, much of this growth came in just ten days (February 22 – March 3), when Ninja’s channel gained over 50,000 new subs. Ninja is very good at the game, easily among its top players right now, rivalling other big names such as Dakotaz and Myth. His skill level mixed with his goofy nature and at times genuinely compassionate personality makes for a very entertaining player to watch. But then there’s also the recent Fortnite Twitch Prime Pack, which became available on February 28 (coinciding with Ninja’s record breaking growth). Essentially the deal is that any Fortnite player who has Amazon Prime is now eligible to Twitch Prime for a free 30 day trial period, complete with a free Twitch streamer subscription and unique in-game skins. Ninja’s growth might well be something to do with these unique free skins, which usually cost around £8 through in-game microtransactions. Third party vendors on sites such as Ebay were quick to jump on this, offering Twitch Prime for around £2.50. This has led to suspicion within streamer circles that compromised accounts and bots are actually making up the majority of new subscriptions to their channels. It will be fascinating to see what happens to Ninja’s subscriber numbers at the end of the 30 day trial period.